Ok, bear with me, this cake may seem like an odd bird, but there is indeed a method to my madness. 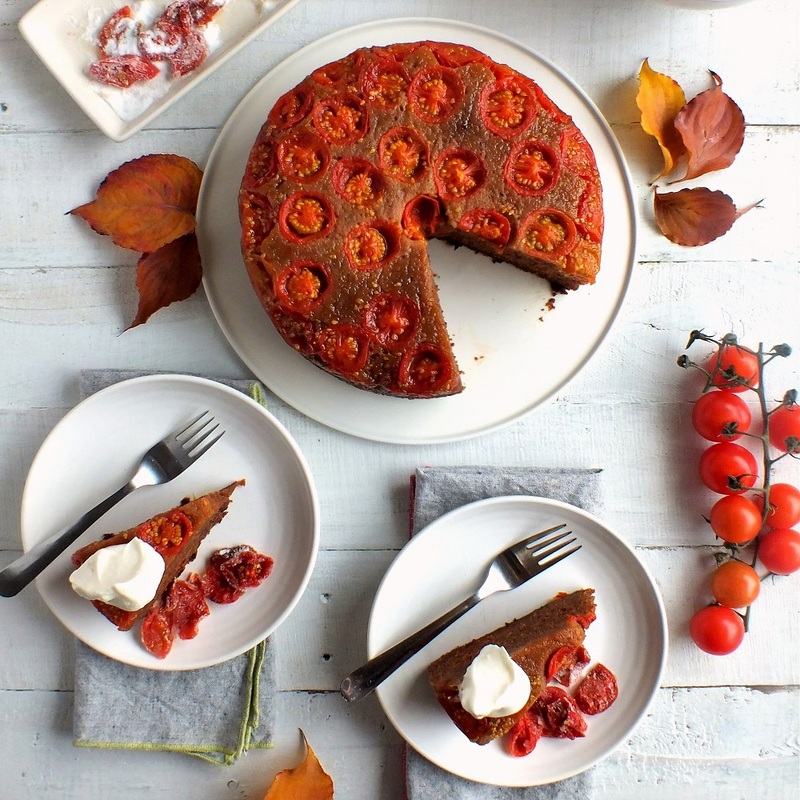 For starters, I thought of the Tomato Soup Cake made popular by the Joy of Cooking and the late poet Sylvia Plath, who, aside from her poetry, was an avid baker in her spare time, and this was her favorite cake! Her birthday was Friday, October 27th, (she would’ve been 85), and people have been posting their versions of the cake online in honor of her, so I thought I’d get on that bandwagon! I thought a fresh tomato version instead of using a can of tomato soup would be good, and THIS RECIPE seemed to fit the bill. The only change I made was to cut the recipe in half and put it in a round pan and to use cherry tomatoes since those are the only tomatoes still in season in October. Did you know local cherry tomatoes are available up until the first frost? Another thing happening this weekend was the release of the new season of Stranger Things on Netflix! This made me want to do something somewhat related to the show, and I thought that an upside down cake would be a subtle nod to the alternate universe in the show, referred to only as “The Upside Down.” Found a few foxy looking recipes for tomato upside down cake online, but decided to go with Rachael Ray’s recipe HERE. And so there you have it. 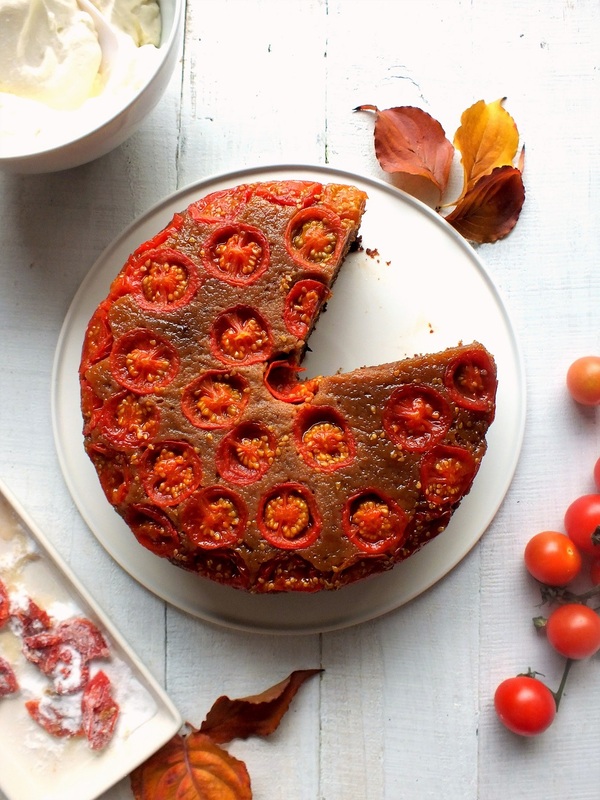 The inspiration for a cherry tomato upside down spice cake for the season! 3 pints of cherry tomatoes – puréeing about 1 and 1/2 pints for the batter and slicing the remaining tomatoes in halves for the bottom of the pan. Butter the sides and bottom of a 9-inch round springform cake pan, and line the bottom with a circle of parchment paper, buttering the top of it. I used baking spray. Melt the butter with the brown sugar and spread evenly over bottom of the prepared pan over the paper. Slice about 1 and 1/2 pints of cherry tomatoes each in halves. Place on the bottom of the pan on top of the butter/sugar mixture, cut side down. Try to fill in all the gaps. Place the 1 cup of puréed tomatoes in a small sauce pan and heat on high to reduce liquid to about 3/4ths of a cup and cool to lukewarm before using. Sift the flour, baking soda, salt, cinnamon, nutmeg, and cloves into a bowl and stir with a whisk several times. Combine the oil, sugar, molasses, eggs, and vanilla in another bowl and mix with an electric hand held mixer with beaters until smooth. Add the flour mixture to the oil mixture a little at a time, while also incorporating a little of the puréed tomatoes between flour mixture additions, folding and scraping sides and bottom of bowl as needed, continuing to mix on low. Pour batter into prepared pan over the sliced cherry tomatoes and smooth out top, if needed. Place pan on a baking sheet because the springform pan may leak just a little, and bake for roughly an 50-60 minutes, until toothpick test comes out clean from the center, and top is no longer all jiggly. Let cool 5 minutes in pan on a wire rack. Place desired platter over the springform ring of pan and turn over upside down, then remove springform ring and base, removing paper lining carefully. Watch for any tomatoes that get stuck on paper and place them back on top of cake, if needed. Serve by itself or with candied sliced cherry tomatoes and/or a dollop of the whipped cream/cream cheese combo. This entry was posted in baked goods, baking, cakes, dessert, food blogging and tagged autumn fruits, Campbell's Tomato Soup Cake, cherry tomato upside down cake, joy of cooking, Mystery Cake, spice cake, stranger things, sylvia plath, tomato soup cake, tomatoes, upside down cake. Bookmark the permalink. Huh. It actually sounds awesome, which surprises me! Thanks Ronit! That’s something I’ve had only once (tomato jam), and it was like a peanut butter and jelly sandwich, but with almond butter instead, and it was so good. But he is somehow not something I think of making from scratch. Maybe I should try it! Oh that sounds amazing!! Thanks for the suggestion! The ones I dried were good too, but took way too long in the oven, so this sounds like a more practical thing to make! Thanks!! 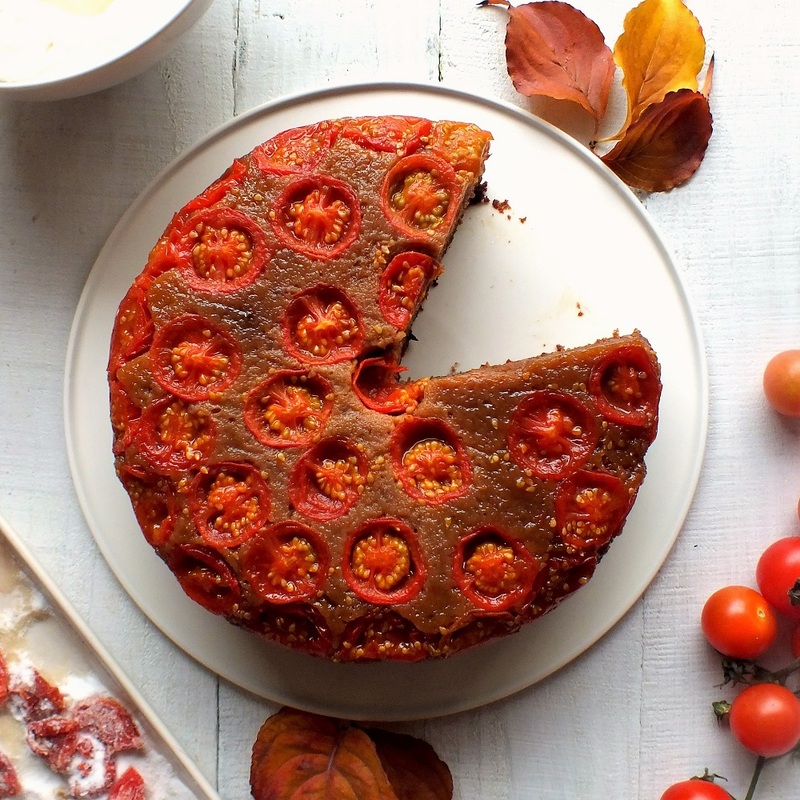 I never made cherry tomatoes in a cake, this is such an inspiring and interesting idea, wonder what it tastes like, but I bet it is really delicious! Thanks Chef. I think it works really well, because technically, tomatoes are fruits and have some sweetness to them usually. They really do, but never thought of it, have to check it out!